I was recently tagged by The_Grumpy_Mum for the #RockingMotherhood tag. I have loved reading other peoples posts, and think it’s a great idea for mums to give themselves a pat on the back! The tag was started by Pat at whitecamellias – and since then has become a hit amongst parent bloggers far and wide. We all spend so much time thinking about the things that we don’t do, or do wrong, that sometimes we need a little positivity in our lives and need to think of the great things that we do for our children, as these are often the things we don’t pay attention to! So, although i’m only 7 months into this wonderful journey – here are 10 ways that i’m rocking motherhood. 1.He ALWAYS comes FIRST – No matter what is going on, or how many jobs I have to do on a particular day – he always comes first. I have missed baby classes, meeting friends for coffee, having a shower, eating lunch – all so his needs are taken care of. When he is having a really clingy day, we have lots of sofa, tv, cuddles and playtime. 2. I try and get out most days as the little man loves being outdoors – If we are having a fussy day at home, then the best thing for both of us is to get dressed and go out. I have been known to put my babybjorn on and trek into central London on the train for a change of scenery, and meet Daddy for lunch to break up our day. 3. I got promoted whilst on maternity leave – Once on maternity leave I didn’t think that there would be a chance in hell of me getting a promotion at work. So, when I was told about a job coming up, I was in two minds as to whether I should go for it. I did, and I got the job! It was a real proud moment for me as Mummy Setra the career woman, and although I am going back to work full time, everything that I do from this moment forward, is for the little mans future. 4. I sing his favourite song “If you’re happy and you know it” about 50 times a day – Since he was a few days old, I have sang this song to him everyday, and I always get a huge smile whenever he hears it – it completely melts my heart! If he is upset, it’s guaranteed to bring out a gorgeous smile! 6. I pull funny faces, and do silly dances in public to make him giggle – I wouldn’t be surprised if people didn’t think I was a bit loopy sometimes when we’re out and about. When the little man is in his buggy I am constantly pulling funny faces at him, and when we are waiting in queues and he is getting fussy I do little dances to distract him and make him smile – works wonders! He loves me making a fool out of myself! 7. I try to do what I feel is best for him rather than what the baby books tell me to do – In the early months, I went through a phase where I read a lot of parenting books and then started worrying when the little man wasn’t hitting the milestones he should have been for that particular week, or wasn’t sleeping through the night when the books said he should. I soon learnt that babies don’t all come with the same “manual”, and all develop differently. I have been much more content since realising this, enjoying our special moments together rather than worrying about what wasn’t happening. 8. I tell him how much I love him umpteen times each day – although he doesn’t have a clue what i’m saying, I am constantly telling him how much I love him, and kissing and cuddling him! Never did I think you could feel this way about another human being so quickly! 9. I’m cooking more from scratch – Being on maternity leave means that I have more time at home to think about what we are doing for dinners. Pre baby it used to be lots of takeaways and easy meals (cooking sauces from jars). I’m now trying to be more adventurous, and have even bought a slow cooker! My motivation behind it all is to make sure we have nutritious meals for our little boy, so he grows up seeing how important home cooked meals are – even if it’s just for family meal time. 10. I try to make our weekends as a little family unit count – Since having the little man, I have learnt just how precious time is, by seeing just how quickly he is growing up. It feels like yesterday when we bought him home from hospital, not 7 months! Although we have the demands of other family members wanting to see him, I like to make sure that we have some time every few weeks where it is just us, for bonding, and making memories. So, there you have it! It took me a while to come up with them, but makes me feel pretty proud of myself reading through them. 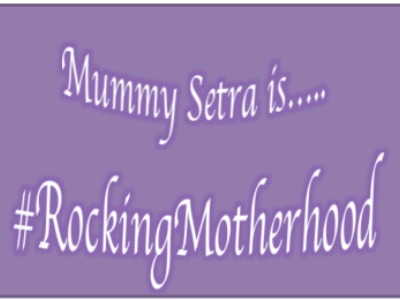 I’m passing the #rockingmotherhood tag to the lovely Debbie, fabulousandus and MummyMrsAndMe. Don’t forget to tag me in your post, so I can read all about how you are #rockingmotherhood. ← 5 teeth at 6 months old – now how do we look after them?! You go mama! Keep on rocking it!